Land law that applies to agricultural tenancies. 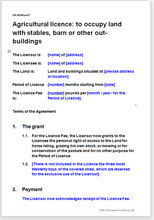 The law in this document is common law, giving you greater flexibility to decide your own terms with your licensee. You should use this document to license agricultural land and/or buildings to an individual only. Using the land for business purposes (such as a livery) requires an Agricultural lease: private grazing or non-agricultural business use. If the land is to be used for agricultural business (such as farming), then a Farm lease agreement is required. It may be possible to use a grazing agreement if the licensee is a farmer using the land solely to graze his livestock. It is important when granting a licence that the term is short. If you are letting on a long term (more than 9 months) then you should use an Agricultural lease: private grazing or non-agricultural business use.